First developed by the British during World War I, barrage balloons were designed to prevent enemy fighters and bombers from commencing low-level attacks against ground targets. 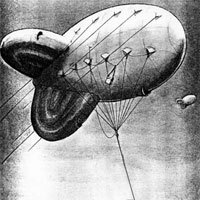 Barrage balloons were used again successfully in World War II. The large balloons were anchored to winches by steel cables, and although the balloons themselves were large and easy to see and avoid, their presence severely limited enemy forces, who were often denied optimum routes of attack. The steel cables presented further danger to any pilot who might dare to fly below the balloons. Barrage balloons were used in Operation Overlord, and many small barrage balloons were attached to larger landing craft for protection during the crossing of the English Channel. Once the landing craft arrived in Normandy the balloons were managed by the 320th Barrage Balloon Battalion (VLA) (Colored), a segregated unit of black soldiers. Headquarters and Battery A of the 320th were assigned to Omaha Beach, while Battery C was assigned to Utah Beach. There are numerous reports of balloons being cut loose after German artillery fire began targeting them. Barrage balloons can be briefly seen in Saving Private Ryan in the D+3 scenes where Captain Miller is given his assignment to rescue Private Ryan.